Can you get a UX job without a UX or design background? Getting started in a new career is never easy—and UX is no exception. It’s not uncommon to feel intimidated. You might be wondering whether that is the right career for you or if you have what it takes to be successful. In short: yes, you can. According to the findings of a research study conducted by Nielsen Norman Group, there’s extreme diversity in the UX field. There is no single educational background defining UX, even though 90% of the respondents in this survey had a university degree. 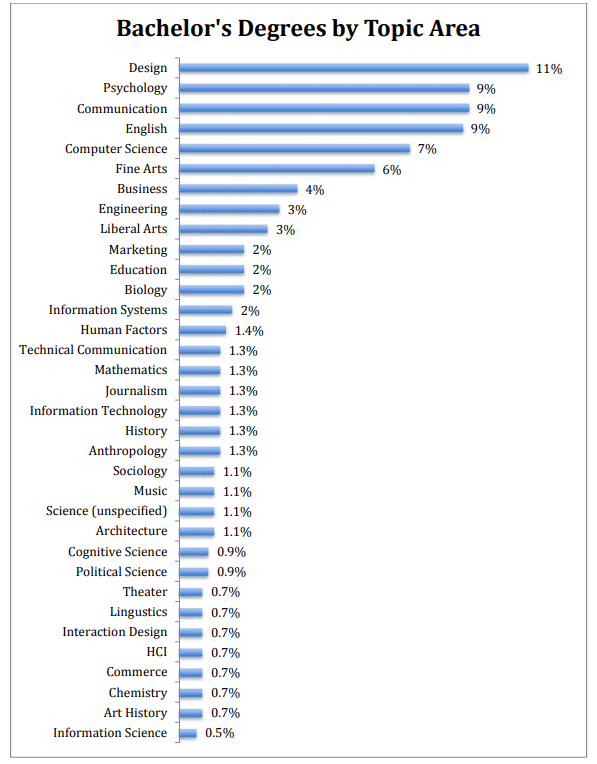 Psychology and design were the most common major areas, which makes sense due to how these connect to UX. But that’s just a small part, meaning that the majority of UX professionals actually hold degrees from disciplines that aren’t even directly connected to the UX field. One of the biggest insights from this survey is that it’s clearly possible to have a UX career without a related degree. No matter what your background is, you can start a career in UX if you want! What skills are important to have? As an interdisciplinary field, UX requires a broad range of skills. Web design, writing, programming, psychology, design, and research methods were highly rated in usefulness in this Nielsen Norman Group report, but it will vary highly depending on your role and the company. One of the biggest mistakes aspiring or junior UX designers tend to make is to focus too much on design tools. Yes, it’s true many roles will specify knowledge of specific tools (and for some, even programming languages) but that’s not the core of UX. New tools are constantly emerging. Learning them is relatively easy. It’s important to remember you’ll be evaluated on soft skills, not just technical knowledge or hands-on work displayed in your portfolio. You should also be able to transfer and apply skills from your previous jobs to UX. Communication and problem-solving skills are key for any UX-related work. How to get your first UX job? Getting started is always the hardest part, but don’t get discouraged. A piece of advice you’ll hear often is to get a mentor. In fact, in the same Nielsen Norman Group’s survey, only 26% of respondents reported having had no mentors. A mentor with industry experience will be able to guide you, helping you with everything from building your portfolio to preparing for interviews. I also highly recommend you network with other professionals: join meetups, conferences, and online communities. If you have no UX experience, you can try to apply for internships, or try some of the tips in this article to build a UX portfolio without clients. Having a portfolio is an essential part of the process. Ideally, you’ll want to include both personal projects and real work within a business context. 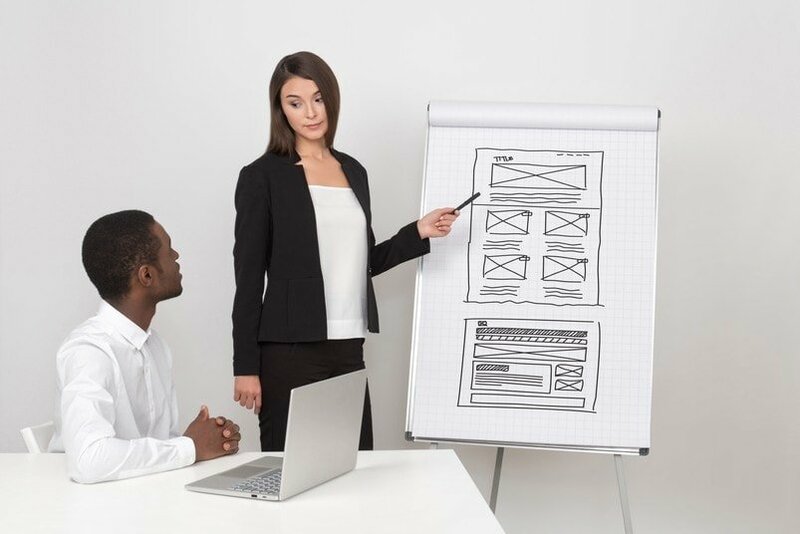 When it comes to UX roles, it’s often easier to start with what is known as a “UX generalist” role in order to do a wide variety of work and then specialize later. At the same time, a company that already has UX roles and processes in place will allow you to learn and grow more easily. Both paths are worth exploring. There’s a wide range of UX roles—and each company can define them differently , which can be overwhelming for anyone getting started. Even the term “UX” is still controversial and you should always pay attention to every single role description to ensure it’s the right fit for you. Overall, before you get your first UX job, you’ll want to get comfortable with the theory but also be able to put it into practice. Even if you have pursued a related degree, enrolling in an online UX program will be extremely useful. I recommend the UX Career Track* at Springboard, where I work as a mentor and can attest to the quality of the curriculum. Springboard* can help you with the things I’ve mentioned above: 1:1 access to a mentor with experience in the field, a career coach able to guide you through your job-seeking strategy, a capstone project and industry design projects to build an impressive portfolio, a great community of UX designers, and even a job guarantee! Affiliate disclaimer: If you purchase through an affiliate link I might earn a small compensation. This has no influence in my personal opinions. Subscribe to my newsletter & get an email every time I post something new! So good. Thank you for your information and advices. Grow a user-centered business that your customers love! Copyright 2019 © Ana Santos All rights Reserved.